Back in 2017 we crossed a significant tipping point. For the first time in the history of medicine -- physician practice owners are NOT in the majority. Loss of autonomy is a major frustration for many doctors. In fact, being the boss has perhaps become a quaint, old fashioned memory. YIKES. It is highly likely that even YOU find yourself floating aimlessly in the midst of the spaghetti pile of a vast bureaucracy - smack in the middle of your org chart with several layers of bosses above you. Even if you have made the effort to build your Ideal Practice Description, you are going to need someone else's help or permission at some point. 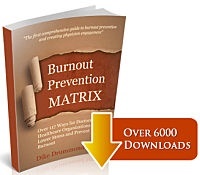 Download the FREE "Manage Your Boss Worksheet"
These people often have the power to dictate the specifics of your practice ... unless you figure out a way to have some influence over their decisions. And there's the rub. How do you maintain some influence over "the system" when you are not the boss??? 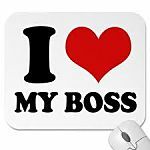 In this article let me show you three keys to managing your boss -- if you are an employed physician. These are the tools you need to take back some control over your practice. "If I am not the boss any more, how do I manage the person who is?" 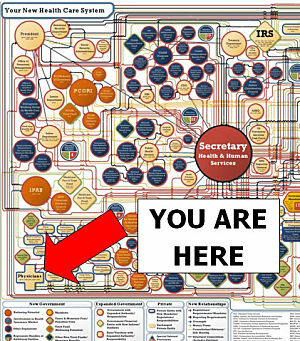 As an employed physician, you will quickly realize you longer sit at your historical position atop the Organizational Chart. These days you have a boss above you. Sometimes this person is not even a physician. This is not a situation where you simply "deal with it". You must manage this person somehow if you are going to find any wiggle room to create your ideal practice. Like it or not, the quality of your relationship with your boss is a huge factor in your quality of life. - A good relationship can boost you to a thriving practice. 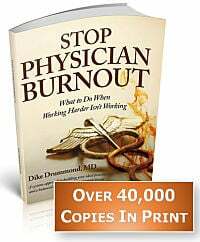 - A poor relationship can lead to burnout and is one of the top three reasons employed physicians quit their jobs. Is your boss an action oriented person who wants the bullet points, then makes a quick decision -- or a detail oriented, introverted "engineer type" who takes time to make decisions or something completely different. Study them and their communication style very carefully. Pretend you are an anthropologist ... carefully observing your boss as a key member of your "tribe". - How do they schedule their days? - How do they prefer to be communicated with? Email, text, phone, in person. - How to the people who have the best working relationships with your boss relate to this person? What "success factors can you identify and emulate? Then practice the "Platinum Rule"
"Treat people how THEY want to be treated"
Match their communication style and personality when the two of you are together. Give them the information and time they want, just the way they want it, especially when you are making a request for change to your work structure. Your boss almost certainly has a boss. They have their own goals and orders from above. Do you know what their priorities/goals/objectives are? The easiest way to find this out is to ask them directly and take good notes. It will be much easier for you to get what you need from your boss if your request aligns with one of their own goals. This is the essence of a win:win solution. - What are their key objectives for this quarter and this year? - What role do they see you playing in reaching these goals? You must understand yourself on these same two levels. a) What is your personality and communication style and how does it differ from theirs? Notice the way you communicate naturally and how that either matches or conflicts with your boss's personality and style. In most cases you will need to modify the way to communicate to connect effectively with your boss. Remember you are striving for the "Platinum Rule" here. "Treat people the way they want to be treated". So if your boss likes all the details and time to consider his/her decision ... give them just what they want ... details and some time. b) What are your goals and needs? If you have created your ideal job description and are using the Venn of Happiness process to continuously improve your practice ... you will probably have requests for your boss every month. Winning your boss's support is often the key to making the practice changes you require. You may need to negotiate back and forth and be willing to accept a bit of a compromise. Do not let that stop you from getting clear on what you want and asking for it. Let's face it, you can't actually manage your boss. You are not in the position in the org chart for that. Most physicians miss this point altogether. Here's how that relationship usually works. You see your boss only a couple times a year ... and most often that is when they are sitting in your office to tell you there is a problem. You can't manage a vacuum. The chance of you getting something you need from your boss when this is the nature of your relationship ... is close to zero. Every positive interaction makes a deposit of good will into this account. You can draw on this balance of goodwill if there is a conflict or problem. If the only time a physician sees their boss is when there is conflict or a problem,you have no goodwill to draw on. It will drive the two of you even farther apart. Regular as in once a month or once a quarter. Get to know them and their goals and make sure you "stay on the same page". - What are your goals for this quarter and this year? - What role do you see me playing in those goals? - How else can I help you get there? 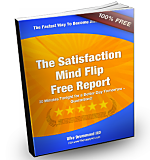 - How do you evaluate my performance ... what are the most important numbers for you? - How am I doing at this time? - What do you see as ways I can improve? - What is something you see on the horizon that I can start preparing for now? Down the road: these are also the conversations where you can ask for what you need to keep creating your ideal practice. Keep working to make deposits in your relationship bank account with your boss. Shoot for a ration of positive 5:1, meaning five positive interactions to every 1 negative or uncomfortable one. This way your balance with your boss will always be in positive territory. => Don't be a whiner ! The typical physician will point to a problem and ask their boss "what are you going to do about this?". This will destroy your relationship and make you adversaries immediately. => Remember the "Continuation Rule"
Every interaction you have with your boss sets the stage for your next encounter. - If you end on a positive note, your next meeting will continue on that same positive trajectory -- even if your discussion is about a problem. - If this meeting ends badly, you will start the next one in the pits as well. Do everything you can to avoid ending any meeting in a negative fashion. 1) Figure out who your boss is. You may need to start here. This may be a challenge in your organization - especially if your structure has changed recently. If you know who your boss is, skip to step #2. 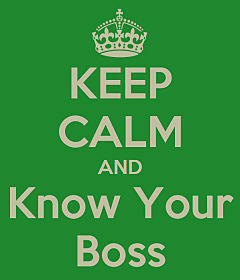 If not, make sure you find out who the organization sees as your immediate supervisor. Prepare yourself to begin practicing the Platinum Rule. Know how they communicate and make decisions. "I would like to buy you a cup of coffee and get to know your goals for me - and the larger organization - so we are always on the same page. I know you are a very important member of the team here and I would like to see how we can each do a better job of supporting the other. When can we get together?" Let them determine the place and time then get on your specific question list for the conversation. The complete list of questions I recommend is in the Manage Your Boss Worksheet below ... a FREE Resource we created to help you get started quickly. Make sure that your conversation adds to your relationship bank account while being real about your concerns when asked. This may be your first collegial interaction ... so do not ask for any changes just yet. Set yourself a goal to increase your knowledge base about their personality, leadership and decision making style and goals/objectives. Get to know your boss as a person too. Do they have children, outside interests or hobbies. Where do the two of you have common ground ... maybe with your families? Take great notes, just like you would with a patient. Always be adding to your knowledge base and building your relationship. Make a habit of scheduling your next visit with your boss before this one is done -- so you always have a relationship building meeting on the books with them before you walk out the door. Quarterly is great. Monthly or every other month is better. Ideally you put the whole year's worth of meetings on your calendars at once before this first one is over. Know what your ideal job is ... and make a prioritized list of the changes you would like to make in your practice. Hold onto this for later meetings with your boss. Here is a training on your Ideal Job Description and creating the Venn Diagram that guides this process. Pick the highest priority change you want to make to your practice. Look at it from two perspectives ... BOTH yours and your boss's. Put yourself in their shoes now that you know more about them and their situation. Create a solution that will be a WIN for BOTH of you. Prepare to present this request at your next meeting. Rehearse your presentation ... your significant other is a great person to play your boss by the way. They usually participate with gusto when invited to rehearse with you. Be flexible and willing to negotiate. Make sure you have a positive balance in your relationship bank account before you make any requests and that your last encounter with your boss was a positive one. When my coaching clients apply these boss management skills, they are often surprised at the flexibility, support and positive working relationship that results. In many cases, things you thought were impossible - like going to part time or getting additional clerical support for your practice - are immediately available when you present a reasonable request to your boss. - How is your relationship with your boss going? - What is one thing you wish they would do for you? - When was the last time you had a relationship building meeting with them?